Want a smoking gun for construction costs escalating every cycle? That is some severe cost inflation every cycle. The total cost of the previous project, including management, is multiplied by 150% with all of the increase of the next project in the cycle going to project management. And that is how los Angeles goes from an in-state, less than a decade cost of of 44.8 million per mile for elevated rail to the next elevated rail project costing 120 million per mile. The increase from 44.8 million to 120 contains three viciously compounding components. The first is reasonable, inflation from 2003-2012 brings us to 56 million per mile, and because of future estimated inflation before the project breaks ground, they assume 60 million per mile. the second is outrageous, it adds two terminal stations not to the total cost but to the PER MILE cost. since the proposed project would have about seven miles of aerial track while traversing the mountains between stops, this would be calculating 120 million extra instead of the fixed cost of 20 million for terminal stations. It doesn’t have to be that way, on page 8 of the same pdf, it lists the three phases of the metro red line (including constructing a 2.4 mile tunnel under the same mountain range) which had significantely decreased per mile costs in each phase, with the biggest savings for the the third phase with the aforementioned submountain long tunnel reach. the red line per mile cost went from 685M/mile to 437M/mile to 323M/mile from phase 1 to phase 2 to phase 3 for a total 17 mile HRT full tunnel subway for an inflation adjusted cost of about 7 billion. Basically metro paid 18 million for one 24 foot TBM (seems high!) and 7 million for the moving it about so it could dig both tunnels. each tunnel was 1.1 miles long and the total invoice for the completed tunnel pair worked out 76 Million or 69.1 million per mile of tunnel. The project is currently over budget at 1.7 billion. the 76 million for the tunnels represents 4.3% of the total project budget, yet it is tunneling that is blamed for the astronomical cost overruns! Well, this is at least partly what I have been commenting and writing about for the last ten years. Any my own experience was evidence. I think my first published piece was in 2008/09, many years before I retired, and I got into trouble with my institute because publishers liked to attach my institutional address to the byline (to give a bit of bona fides, not totally unreasonable). But the institution had a repressive policy on what staff (even though they never paid my salary, true for most self-funded scientists) can say or write in public. Right there you have the modern syndrome of information control, and how they control it by threats under the guise of protecting the institute’s reputation blah blah. And of course you have signed up to it when you joined the institute. The answer cannot be that these politicians are all corrupt. The inefficiency in construction does not go to any serious politician’s pockets. Corruption might, but that requires me to believe that all relevant mayors and governors take bribes, which I wouldn’t believe of Italy, let alone the United States. That’s right but this money is used to lubricate the office holders in various ways, if only to diffuse visible opposition. I mean what was behind Cuomo’s appointment of Lhota as chairman of MTA? Whatever it was, it was entirely political and personal to Cuomo, ie. nothing to do with government and its operations. We know this stuff happens and has always happened but not it has taken over everything. But more fundamentally, in the USA it is accepted practice for incoming political leaders to replace the entire top layer of public servants with their own appointees. Presumably this has been considered very “democratic” to facilitate implementation of the voter’s approved agenda. However in the Westminster tradition that Australia has/had, the norm was that the management level of the public service was a repository of institutional memory, and impartial advice that could also include political advice (as accurately portrayed in “Yes, Minister”). In this way it facilitated long-term projects and provided deep knowledge that safe-guarded the national interest. In Australia we don’t have to speculate since it is in the record that John Howard did exactly this upon entering government in 1996. Senior civil service positions, especially heads of departments, became contracted positions and now worked at the pleasure of the politicians, instead of the people as originally intended. No longer could there be confidence in advice from the top of the civil service as it was now utterly infected and corrupted by overt politicisation of the worst kind. I believe this fundamental institutional structure is what has made the Anglosphere so incapable of enacting common sense policy on so many fronts. It can’t change until/unless this changes. It really is the fish’s head that needs cutting off. Perhaps Trumpism is a glass-half-full, because it is the ultimate endpoint of such a system: so much churn at the top departmental level at the whim of a malignant-narcissist boy-president it has rendered the entire system and country paralysed. *A stark illustration of this became public and created various legends in the 80s in the Spycatcher case in which a young lawyer (Malcolm Turnbull, who eventually became PM) entrapped Thatcher’s Cabinet Secretary (sort of chief (enforcer) of civil service) Lord (later Baron !) Armstrong in a big lie while under oath under dogged interrogation by Turnbull eventually admitted the lie with the now immortal phrase that he “may have been economical with the truth”. The British government tried to gag publication of Peter Wright’s book revealing various things about MI5 (for which he worked, this has stuff on Public Key Encryption) and tried to stop its publication in Australia, where they failed spectacularly and embarrassed Thatcher. The UK continued to (ineffectually) gag publication or discussion of it in the UK until they lost the case in the European Court of Human Rights–so you can see how this case was so emblematic of the era. It all came about because of MI5/GCHQ’s penny-pinching refusal to pay Wright (a career spook) his pension in retirement in Australia! A bit of pure spiteful and petty Thatcherite austerity! This very cleverly connects the symptoms of rot at the top we see in these three countries. What about Canada? Is Quebec different in this respect? I don’t know much about anything much, but I know even less about Canada. Having said that, I have often felt they benefit from being Anglo-French (and they gave the world Joni so … ). Alon is in denial but certainly I think many things of this nature work in France as they more or less should work in a democracy. Those grands ecoles actually produce people who get to do as they are trained to do, some of them become senior civil servants and politicians listen to their advice. Has Canada still got a civil service that people respect, and act in the national interest? Quebec is corrupt as it can be – whether it is better or worse than the rest of Canada can be discussed. After all, the new Ontario PM was elected on – amongst other things – to provide beer for 1$. Transit speaking, whatever happen in Quebec happen in Montreal. And wathever happen in Montreal is decided in Quebec City (provincial capital, about 8 times smaller and the city with the more freeway per capita in North America). Hence, transportation projects in Montreal are imposed from Quebec City on purely political motives. And not only they do not do the right things, but they do the things wrong. Significant transit projects in Quebec are really rare, but the few lasts were outraging: some useless commuter train line that costed $700M, an awful and expensive BRT project in Gatineau that is so flawed that it do not even work, and the Laval Metro extension that opened in 2007. We can’t really say that it was very expensive ($ 150M/km) but it started as a $ 150M or so project and ended up costing $ 700M. Having know that from the beginning (which they knew, since they started digging the tunnel from the wrong side to make sure the project could not be stopped after it was started). On top of it, it increased a problem of overcrowding on a stretch of the U-Shaped line 2, which could have been extended to about the same point using the opposite underused branch. Now we have a completely unbalanced system and need some relief. This project was imposed without anybody having anything to say, and was supported by a massive propaganda campaign. It involve massive a massive giveaways of public funded infrastructures to some pension fund (Caisse de dépôt du Québec, nothing more than a holding company) which will generate a 8% garanteed profit from the exploitation of the Skytrain – while the public will pay for the infrastructure and subsidize it’s operation massively. In other words, downright crazy. Since they do mostly road building in Quebec, much corruption occur in that field. Private mega-hospitals… All mega projects are ridden with fraud, corruption. Of course it’s not the workers working on the construction sites that do the corruption. But there is corruption and it do not bother much anybody. Business as usual in fact. It’s pretty hard to explain corruption the roots of the corruption in fact. There was a big and expensive enquiry on corruption and collusion a few years ago that resulting in absolutely nothing: all the corruptors were left unbothered, some of them where already dead and others were protected by political interference of one way or another. Quebec (even Canada, for that matter) is a small country and the border between politicians and business people is vague to say the least. A whole bunch of corrupt politicians can come from a single village, the most backward that you can think off. Not that everybody in Quebec is criminal, but it seems that only the most perverse and venials people go in politics. But we have to be faire to the transit agency operating the subway and the buses in Montreal. They actually do a pretty good job considering the context. The machine is well-rounded. According to an accointance who travel everywhere in the US, the only subway where things work as they should that he know of is that of Montreal (that can be discussed but just to say how its actually pretty well). So is Quebec different in this respect? Yes and no: maybe yes if you look only at the STM (Montreal’s bus and subway operator) but no for anything else. So overall, i would say it’s the same as anywhere if not worse. The REM did not go to Bombardier (which surprised me and caused heads to roll there). It surprised me too. I can’t complaint about Bombardier equipment in Montreal though. But if we want to sell our trains to every country, why should’nt the other countries do the same and at also, why could we not benefit from possible lower prices – since the governements do not run on cash anyway. But maybe they are right to give the contracts right away to Bombardier. The whole thing just lack transparency and the public have good reasons to be suspicious. As for the REM trains made in India, there is so many bad things about the REM to begin with. It’s like the cherry on the cake of CDPQ’s arrogance. They used all kind of stratagems to avoid respecting all laws and reviews. The REM will force the premature retirement at only 25 years of the actual Bombardier MR90 EMU’s that was quite reliable as far as I know. 1) The ongoing Scarborough Subway saga. Steve Munro’s blog is a must read for understanding this, and the various competencies at all levels with the TTC. 2) The 2015 Metro Vancouver transit referendum, a destructive bit of posturing on the province’s part in opposition to nearly all local political leaders, delaying transit expansion in Vancouver by at least half a decade. 3) The recent transit politics in Montreal, where the mayor was elected on a strong (and well advised) pro-transit platform, but lacks the funding resources that the provincial gvn’t is loath to provide, whereas the provinces pet project, the REM, is going ahead despite quite a lot of fishiness and the sell-off of public infrastructure. See Anton Debrau’s blog cat-bus.com for details on REM. On the operations level, most canadian transit agencies do a decent job, though there’s room for improvement. 1) Of the major transit agencies, I think Translink is the best of the bunch for operations, and have been since before Translink was an independent entity. This is possibly personal bias, but despite significant challenges in running some of the busiest bus routes in North America, I’ve rarely seen a challenge they didn’t address or be concerned about. You can also look at the planning they did for the 2010 Olympics at all levels, to keep the city running smoothly. 2) Again, read Steve Munro on the TTC. This agency operated under a particularly unique set of constraints, in it’s use of loading and performance metrics to decide on scheduled service levels, significant operating fund and rolling stock constraints, and poor maintenance of bunching and other hour-to-hour operating issues. 4) A lot of smaller bus agencies also have staff that are invested in improving service and trying new things, many of which have been concentrating on trunk services and stop consolidation (e.g. Kinston Transit express buses, Fraser Valley transit South Fraser Way route overlapping). Generally, there’s strong interagency sharing of knowledge and shared planning resources, at least between agencies within a province. The construction costs in Canada are horrendous, and Montreal behaves like English Canada rather than like France (link). The high costs in Montreal are one of a few pieces of evidence I have right now for why, contrary to my previous belief, high Anglospheric construction costs are not the fault of English common law; high costs in consultant-ridden civil law third-world countries like Vietnam and Indonesia is the second piece, and the differences between Indian construction costs when indigenous IR expertise is involved and when first-world consultants are brought it are the third. The REM disaster further reinforces the fact that the same kind of poor planning we see in the US, English Canada, and the UK can fully afflict a Francophone city even if on the surface this city tries to be Paris rather than Toronto. I say “on the surface” because Quebec’s muh culture hangups, like the hijab ban, are much more Nice and Marseille than Paris, which doesn’t have an inferiority complex toward anyone and rejects that kind of populism by enormous margins. Most of the projects listed in your previous post are in planning, and subject to the significant political gyrations mentioned above. Looking at projects without this level of interference, say the Eglinton Crosstown, the cost is still higher than non-Anglosphere countries, but below other North American transit cost. Mind you, we will have to see if Bombardier’s incompetence with the rolling stock causes significant increases in costs. 2019/02/01 - 22:58 Alex B.
Quebec is obviously culturally francophone, but is it legally distinct from the rest of Canada? If the rest of Canadian courts inherit common law cost issues, wouldn’t much of tha also apply to Quebec? I’ll admit I know nothing of the Canadian court structure. Quebec uses civil law, and in fact Canada requires a minimum number of Supreme Court justices to come from Quebec to make sure they’re familiar with its unique-for-Canada legal system. After all these comments on Montreal and Quebec I’m not sure I’m any the wiser. Montreal appears to have North America’s number 2 or 3 Metro system by ridership. I can’t quite see what is so bad about the REM. Sure it is running late and doubtless the budget will blowout, but it seems like it was only seriously proposed, and planning begun, in 2015 … which is yesterday in transit planning terms, so why so much angst? Unless I misinterpret, it is like Paris-RER and perhaps the first such project in N. America? If it comes in close to budget (about $6-7bn) it looks cheap for a 64 km RER. The REM issue is complicated. Basically it’s not a transport project but a real estate project. The problem is that it will jeopardize the existing transport network and massively privatized public transportation infrastructure and the supposed benefits it will bring are really doubtbull, considering 1) that the Deux-Montagnes line is already the most modern commuter train, the only one electric, that was entirely rebuilt in 1993-1994 and operate 260 m long MR90 EMU’s. It will have to be rebuilt entirely to accomodate the REM, whose trains are only 60 m long. So the capacity will be almost equivalent, with no cheap way to expand it thereafter for a couple of technical reasons. The existing commuter line minimum possible frequency is 15 minutes which could have been cut in half with the minimum of construction. They could also run trains every 15 minutes all day but they are just not interested in providing train service ”when freeway capacity is not exceeded”. Although this (about) $200 M expansion is expected since the line is reopen in 1995, some things were actually done ($ 71 M grade separation and various upgrades), the line and the tunnel was bought from the CN, all this with public money. Now all this public investment is lost to the pension fund who can even sell the REM after 5 years of operating it. 2) The branch across to the south shore is quite decried to because it will impose a transfer on existing express buses users. It will hence increase the trip time for these people. Anyway something would have had to be done eventually because the downtown end of the existing busway is choking but their goal is to make profits for the pension funds, that’s what they said from the beginning, so providing good transit is secondary. 3) The monopoly of the REM on the Mount Royal tunnel even block the $700 M Train de l’Est to access Central Station. The Train de l’Est (10 cars double decker trains) users will have to transfer to the 60 M REM trains somewhere under a road bridge (if the line even survive since it’s ridership is just not materializing and many suggest that it might be in geopardy because it won’t reach downtown). It will also block apparently forever the Mainline Quebec-Windsor project that is suppose to use the underused ex-CP north shore line between Montreal and Quebec. 4) The airport branch, requiring a 5-6 km tunnel, expect a ridership in the range of 2500 trips per day. When there is two double track mainlines with more direct to either Windsor or Central stations 500 m south of the airport terminal. 5) The last, West Island branch, is paralleling an existing (Lakeshore) commuter line, which future might even be jeopardize by the REM. Well, all the communities along the Lakeshore are old and ”train oriented” when the new REM branch will be in the middle of an industrial corridor (buffer zones each side of the Transcanadian Highway) and will accessible be principally by cars since their will be few stations anyway and they are not coordinated with the arterial road networks. On top of it, the real estate development that is suppose to happen at it’s extremity is on the last piece of country in the island of Montreal and in a flood risk area anyway. On the south shore the terminus, it’s parking laguna and the development will happen on prime quality farmland. Etc Etc Etc. So for all of these reasons, it was’nt approved by the Bureau d’Audience Publique à l’Environnement, which is like the environmental assessment, and other reviews, and then Montreal ex-Mayor said: ”Le BAPE c’est pas le Pape” (The BAPE is not the Pope) and they kind of dismissed all the critics and legitimate concerns of everybody. They even pass a law so they can expropriate people without them having any appeal wathsoever (that work for oil prospection too). Now the project is going on and the existing trains users are left in the lurch day after day because of all kind of problems. People have to move because they can’t travel. And from 2020 the line is gonna close completely and as yet nobody know what will happen (in term of replacement services). The alternative would have been to enhance the existing electric commuter rail which would have been very easy since the line is largely grade separated and is not shared with any other services nor freight. Cities spend billions to build through-running downtown stations while in Montreal we already have that (and waste it). The south shore problem need to be adress separately. Another stupid thing, they are building a replacement for the ’60-era Champlain bridge now that is barely fit for rail; it will handle the REM cars but could’nt handle North-American heavy-rail cars. But Anton Dubrau (http://www.cat-bus.com/2016/09/new-champlain-bridge-barely-built-for-rail/) fount out that it could bear (that the allowable load per axle would permit) several types of 25 kv (foreign) mainline railway cars. So there is alternatives. As for the two other branches (Airport and W-I), they could be droped off entirely. We can’t build metro lines for (respectively) 2500 and 8500 trips per day. After that we have elections in Provincial and City and you do not see a single candidate to call the REM into question (do you think any of them even understand anything about these things, except that there is money to be made one way or another). ”The REM is an 67 km electric light rail system”. That is all the public at large ever heard (repeated about a 1000 times). – taking an existing mainline tunnel serving a mainline terminal and rapid-transitizing it in a way that removes it from the general system of railroads. This has the effect of severing one of Montreal’s lesser used commuter lines from Central Station, but also of preventing VIA rail from ever expanding through the tunnel and rebuilding a regional railroad through Trois Riviere to Quebec City which is a superior, through-running, non-class 1 freight controlled route to the existing CN route that VIA uses, just needing investment. – Other branches out into far suburbia that plan on building large parking garages rather than urban buildings or bus service. ”Privatization is the proper word here. And we’re doing it without any competitive bidding process, we’re simply handing over public assets in return for some amount of money we don’t even know. And in response to Alon Levy, you are right about the REM and Quebec and consultants etc. All the mains engineering firms in Quebec are culprit of fraud and corruption BTW. About the Hijab controversy though, i would dare say that it’s totally exagerated by crazy ignorants politicians who come from backward villages for purelly partisan purposes. Racism and xenophobia and etc is not merely an issue in Quebec and Canada, compared to France or even US – and it never was. How an election campaign can be oriented almost exclusively on this subject is another example of how the politicians are disconnected from the reality, if not plainly dishonest. In a cases disgusting. They just try to raise fake issues to keep people busy with so they can continue their corruption and theft. After all, everybody in Canada is an immigrant, or of immigrant descent, even those who arrived on day 1. Not to say that nothing wrong never happen in Canada or Quebec, like the real historic anti-semitism (the newspapers articles and the books from the ’30) and that sort of things, but in that case, it was almost exclusively restricted to (a part of) the crazy intellectual elite, which, as often, is not representative of the whole population in any way (especially at that time when almost everybody were cultivators). And the perpetual ”persecution” (might not be the most accurate word) of the original people (the natives). Sorry for the off-topic, but there is even more issues with the REM i was just reminded of: it will render useless 20 very expensive dual-mode locomotives that were just bought to allow progressive electrification of commuter lines (and there is not even any other electrified railroad in Canada.). Even worst, it will render almost completely useless and/or innaccessible from all lines but the St-Hilaire commuter line, a $400 M maintenance site for commuter trains which construction is not even complete. So yes, the REM is total BS and fraud. I must admit that does sound like the full monty of Anglosphere disease. It is horribly contagious. I can only suggest Vive le Québec libre. If it’s a real estate project, I’m hoping to at least see some good TOD out of it. 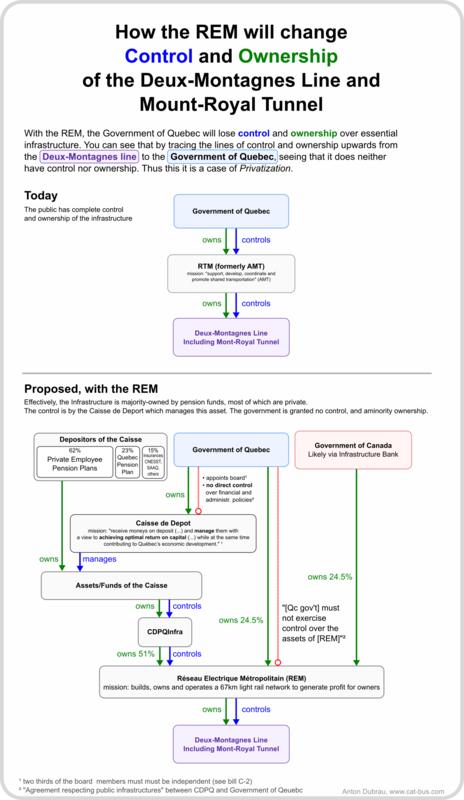 One thing I don’t understand about the structure is that, since the Caisse is effectively owned by the government away, why does the government need to hand over ownership? What difference will it make? They can just hand over control of the line in the form of a long lease. Oh well. But with the Caisse control and ownership in mind, I think the government will intervene to get things back on track in case Caisse mucks it up since they effectively own it. A good example of this may(?) be SMRT which is owned by Temasek, a Singapore government owned fund similar to Caisse, and the Singapore Government intervenes in SMRT from time to time even though they don’t directly own it. Aside from the ownership part, another part I think they mucked up was capacity. I don’t know they picked a light metro. Considering there will only be 4 cars to work across 3 different branches on the western end that will be getting lots of new real estate projects, this will not look pretty in the long term. Maybe in the short-medium term it will work but getting 4 car trains on 3 different branches that will get lots of development doesn’t sound right, even if they ran lots of trains at closer headways to make up for it, it still doesn’t sound like it’s enough. From what i can tell the capacity will be insufficient. Since the line will run through a 5 km tunnel under the mountain, up to at least 250 m deep, with only one intermediate station, the minimum possible headway will be over 2 minutes. Capacity expansion would involve either building emergency exits from the tunnel to the surface (or digging a parallel tunnel). They say that people will adapt their lives to the REM so that it will be carry an equal load through the day instead of having trafic concentrated during the peak… Can you believe that. As for TOD, i don’t expect to much either. They will probably build what is profitable in the short term (and then dump the problem on the public as usual). « The REM markets itself as a “public-public partnership”. Since the RTM (former AMT) is a public agency, and the CDPQ is a crown corporation, who cares who owns what. Who cares about subsidies, isn’t it just a case of moving money from the left pocket to the right pocket? Make the arrangements complex it gives them more opportunities to skim off vigorish. And another platoon of managers to be hired. You reference CalMod as a half measure currently. What would make it a “full-measure”? Does Caltrain not have POP? It does, but it still has two conductors per train conducting the POP because what’s a roving team of inspectors. A reminder that Caltrain and BART both have distance-based fares (are not like the New York subway). The dominant school of thought in America is that the gold standard for transportation equals driving cruise control 10 MPH over the speed limit and ALL transportation investments ultimately have to fit in that paradigm. This is root cause of why we can find big money for adding rush hour commuter rail lines, but we can’t seem to find anything for running reasonable off-peak frequency on the equipment we already have. The American congestion paradigm/obsession creates the 2 big issues of American Transit: 1) Across all transportation modes, we only invest where its perceived to supplement rush hour commuter capacity. This makes for a lot of bad/overbuilt transportation investments, both for roads & transit. 2) The country is gradient between high congestion & low congestion areas. Manhattan, Boston, SF are the most congested places in the country so there’s really no ceiling on what we’ll justify spending…. So we overspend by nearly an order of magnitude (not just on transit; Boston spend 22B on a few miles of highway tunnel). While in low congestion places, there’s zero support for transit beyond a mediocre service for the poor & disabled. Is there any area of the country that looks as if it were escaping that paradigm? Yes, and also given the corruption in Italy and Greece, both of which have low (if not Spanish-low) costs. But I have a suspicion that in all three countries the part of government that’s responsible for infrastructure isn’t especially politicized, so it’s more professional than the rest of the economy, which is a cesspit of corruption and tax dodging. Spanish railroads are quite a paradox. On one hand, the infrastructure side is extremely competent, and can build anything quickly, cheaply, and with great quality. ADIF, the infrastructure agency, is headed by an engineer that has been involved in building rail lines her whole career, and the top leadership is consistently top-notch. My interactions with them always show a competent, well-run agency. The Renfe side, the guys that operate the trains… well, that’s all over the place. Some departments are REALLY good; commuter operations are consistently brilliant. Madrid and Barcelona have really complex networks, run with high frequencies and high reliability. The regional trains are less consistent, but in places where the infrastructure is there (that is, where the conventional lines are not single-track relics of the XIX century) they operate well. Long-distance mainline and high-speed trains, however… oh boy. They have shiny, shiny trains, on often gleaming infrastructure, and they operate them as they were running a very shittily run postal service. Zero sense of how to attract or increase ridership, offer competitive pricing or get the most out of the rolling stock. I am really looking forward liberalization on long-distance service because Renfe does need a competitor there, and they need it badly. The freight rail side in Renfe, by the way, is utterly, completely, absolutely useless. There’s still some mysteries that I need to investigate someday if I ever get time. While Madrid Metro and Cercanias (RENFE) are both good to use, it is funny that they still do not have fare integration. I was caught off-guard this year as Metro has switched to a new smartcard system for fares, and apparently Cercanias has as well, but to my further surprise they are still separate. Also the network structure of the Madrid Metro is… strange. For example, Avenida de America is a massive transfer station with four metro lines. Yet not a single one of them goes anywhere near the critical central stations like Puerta del Sol, Callao or Gran Via, necessitating at least three-seat rides for many trips. It almost feels like Madrid Metro is really two separate systems that only incidentally make contact. Another oddity is Linea 11, which terminates at Plaza Eliptica, an outlying station on Linea 6 (Circular). Again, it forces three-seat rides on pretty much every trip from that area. The Metro Sur expansion has long been praised here and in other places for its extraordinarily low cost. However it is basically a loop at the end of a long line out of the city. I can only imagine how frustrating it must be to use on a daily basis. Perhaps it was not intended as such, since most of the area is also served by Cercanias. I know that my friend who lives there (and grew up there) will do anything to avoid using the Metro because of how long the trip is. He is also very cynical about corruption in Spanish infrastructure construction and was surprised to hear me praise Madrid Metro. Then again, Malaga Metro extension looks to be a real nightmare. I could hardly believe that after two years since my last visit the construction seemingly had gone nowhere and the street is still a big mess. Website says it’s been delayed until 2020. Sounds familiar. The lack of fare integration in Madrid is baffling, really. Monthly passes are integrated, but nothing else is. This is particularly odd because Barcelona, a place that is quite a bit messier politically, has full fare integration, and has had it for years. Regarding Metro’s oddities – L11 is supposed to be extended to Atocha Station, and from there cover the Eastern side of the city. It is a complex project and there is no real agreement yet on the alignment, so it has been on hold for years. Regarding Avenida America, Madrid is surprisingly decentralized in terms of ridership. Sol is the busiest station, but Moncloa, Principe Pio, Nuevos Ministerios, Avenida America, and Plaza de Castilla are all above 10M entries a year. Avenida America has a direct connection to all of them but Sol; the circle line is the true workhorse of the system. I think Metro Sur could work well if it had fare integration and convenient transfers to Cercanias. Take a frequent Metro for 1-3 stops, then switch to frequent regional rail, doesn’t sound so bad for a commute from an outer suburb. Line 11 is planned to be extended all the way through Madrid, so no 3-seat rides, but who knows if/when that will ever happen. As for Avenida de America – the point of a network is not to connect stations, the point is to connect human origins and destinations. Each of the lines that serves Avenida de America has a convenient transfer to the “critical central stations”, just not at this point. So anyone from any of those lines has a 2-seat ride to the “critical central stations”, NOT involving Avenida de America, which is probably crowded due to transfers between the 4 lines there. This is a means of spreading the passenger load so no station is overcrowded. It means constructing the network as a sort of grid, not entirely radial. Just as a grid is the most efficient method for a street network, once a metro network gets big and busy enough (which is only the case in a few places worldwide), it should have a grid in its central portion too. How are the changes in Madrid government (long time PP hotbed, now governed by a Podemos aligned mayor) and the whole Catalan independence brouhaha affecting the public transit in either region?